County Comm Government Products Group has made a limited number of their lightweight 6061 T-6 Aluminum Alloy and heavyweight Stainless Steel Embassy Pens in the "REV 2" versions available to the non-government market. 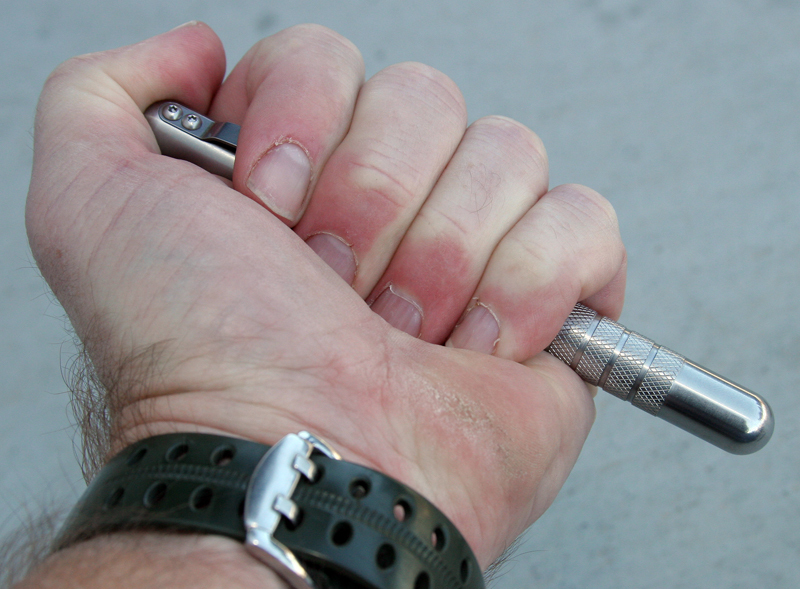 The “tactical pen” has become a big category in the last decade. The cottage industry defense contractor, County Comm Government Products Group, has released a limited number of their heavy-duty Embassy Pens in both lightweight alloy and the heavy stainless steel version. 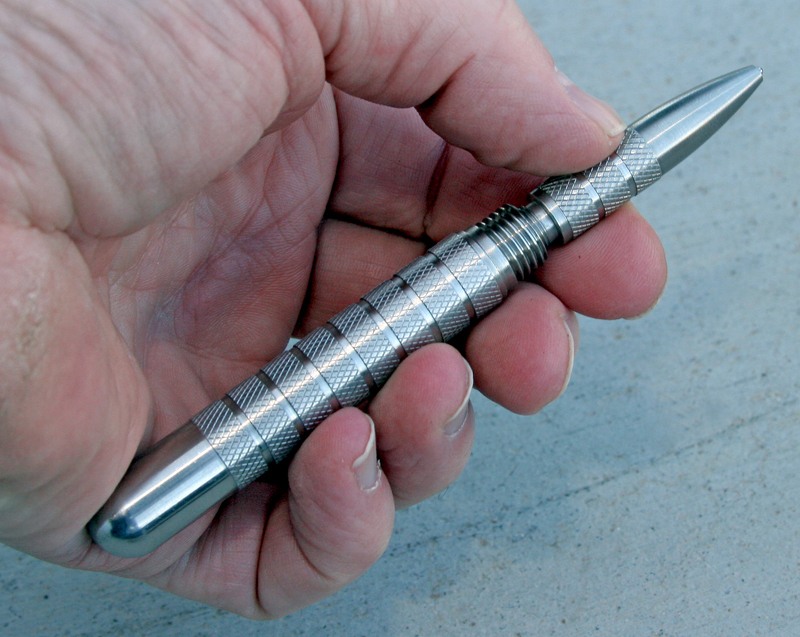 The “tactical pen” was given life by writing instrument innovator Paul Fisher of the Fisher Space Pen Company. Fisher invented a refillable pen cartridge that could work in different pen “bodies”. He went on to develop a more dependable pen cartridge using thixotropic ink. Thixotropic ink is more leak proof, less messy, dries faster and applies to varied surfaces more evenly since it remains in a mostly solid state inside the pen until the action of a rolling ball pen tip causes it to liquify, coat the pen tip, then flow evenly onto the surface the pen is writing on. The heaviest of the County Comm pens we tested, the Stainless Steel version (silver, 3rd from left), is nearly ten times more substantial than a standard Parker T-Ball Jotter retractable pen. You can read the weights on these pens for comparison by clicking on this photo to enlarge it. Fisher went on to fill the thixotropic ink cartridge with nitrogen gas at higher than ambient pressure. This pushes the ink out of its storage vessel, onto the tip at all angles. This system does not rely on gravity to feed the thixotropic ink onto the rolling ball writing surface where it is liquified. 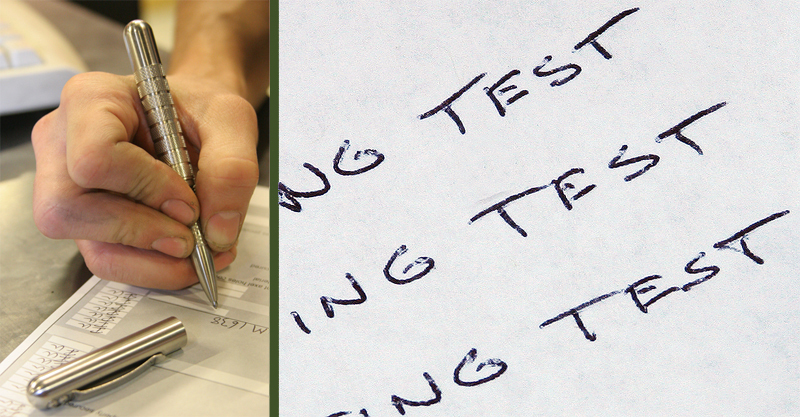 The pen always writes dependably- at any angle. It is not reliant on gravity to feed ink to the roller ball. The pen can literally write upside down, in a zero gravity environment and even in a limited negative G environment. Fisher was granted a U.S. patent in 1965, Patent # 3,285,228 “Anti Gravity Pen”. Three years later the pen was made famous as the “NASA SEB 12100051 Data Recording Pen” by NASA Astronauts on the Apollo 7 mission. Fisher Space Pen Co. claims NASA tested the pen “for two years” before implementing it in the Apollo Space Program. The threaded cap and surface knurling on the County Comm Stainless Steel Embassy Elite Pen (REV 2) is beautifully precise and well done. On a practical level there are few things more frustrating than a pen that doesn’t write, except a pen that leaks and ruins clothing or a brief case and documents. Fisher’s Space Pen Cartridge proved remarkably reliable and caught on quickly. Market share steadily grew as Fisher Space Pen released more models. A satirical episode on the TV sitcom Seinfeld was even written featuring the Fisher Space Pen. Handling and feel on these pens is very nice. The Fisher Space Pen pressurized cartridge produces good quality, dependable print even upside down, like this sample was made. The pens from County Comm Government Products Group are large, precision machined bodies for the Fisher Space Pen Cartridge. The heavier Stainless Steel Embassy Elite Pen (REV 2) is large and heavy enough to use as an improvised weapon like a kuboton. The kuboton is a hand-to-hand combat weapon developed (and patented) by Takayaki Kubota in the 1970’s for use by the Los Angeles Police Department. As a result of its improvised weapon capability, the TSA likely won’t let you take one of these pens through some airline security inspections. The size and heft of the County Comm pens give them some "weapons capability" in the most desperate circumstances. Because of this the TSA may not let you carry these on a commercial flight. 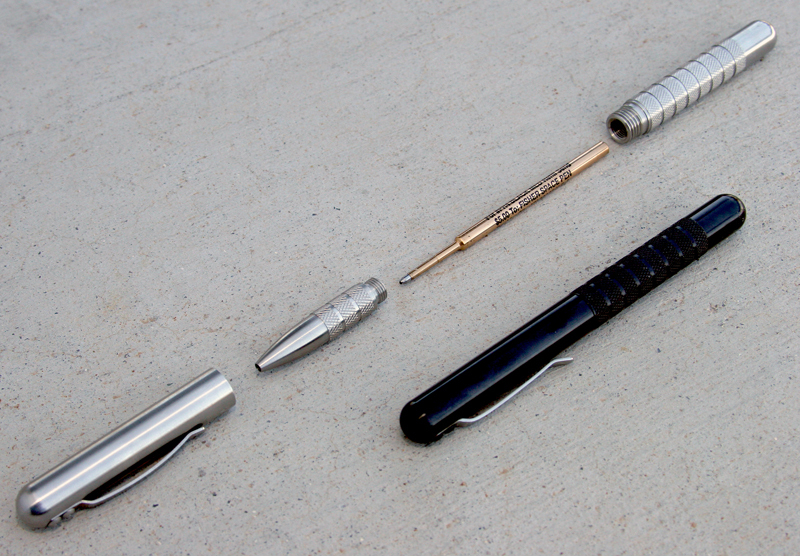 County Comm Government Products Group offers three versions of the Embassy Pen: The Titanium Embassy Pen made of 6/4 vanadium/titanium alloy ($85), the exotic Solid Copper Embassy Pen ($175), the Stainless Steel Embassy Elite Pen (REV 2) and the 6061 Aluminum Alloy Type 3 Anodized Embassy Pen (REV 2) ($44.50). We tested the Stainless Steel Embassy Elite Pen (REV 2) ($55) and the black 6061 Aluminum Alloy Type 3 Anodized Embassy Pen (REV 2). 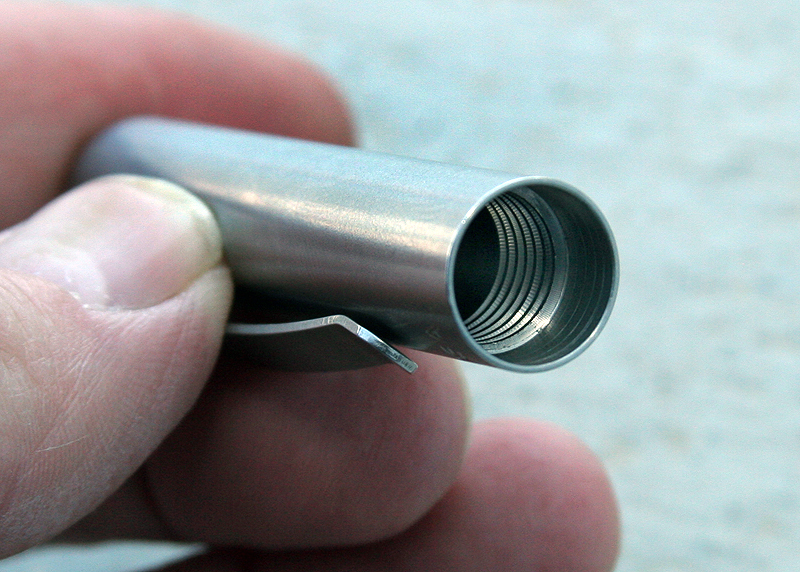 The top of the pen unthreads once opened to insert the Fisher Space Pen pressurized cartridge. Tactical pens are basically metal housings for the Fisher Space Pen cartridge. The thing that sets them apart is the level of workmanship and the design. The County Comm Government Product Group pens are unique because of their hefty design, nice finish, pleasing shape and good ergonomics. 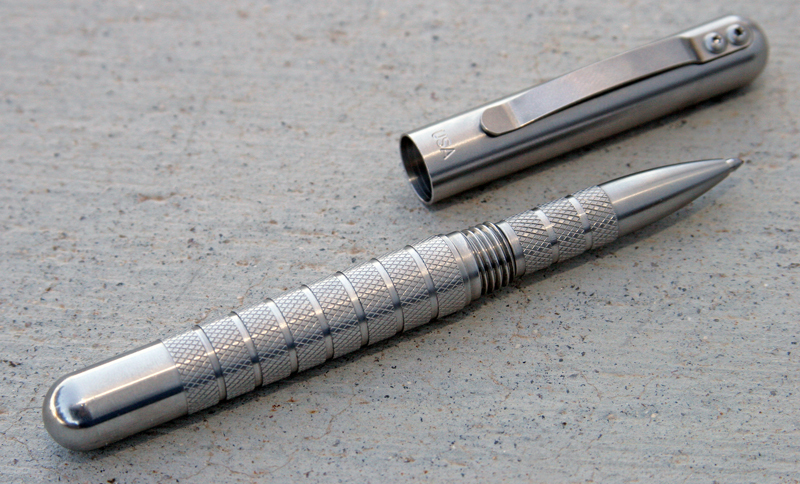 The heft is especially apparent with the 107 gram (3.77 ounce) Stainless Steel pen we tried. These things feel substantial in your hand, especially the heft of the Stainless Steel version which we weighed in at 107 grams, about the same weight as a coin roll. It feels nice to write with a heavy pen- as long as you don’t have to write too long. The heavy Stainless Steel version is a great choice for a police officer writing a short ticket or someone taking notes. I wouldn’t want to write out a report with one of these pens though. The lighter weight aluminum alloy version is very nice for longer writing projects though. Pen sizes for comparison: Bottom, Fisher Space Pen. 2nd from Bottom, Parker T-Ball Jotter, Top two, County Comm stainless steel and anodized 6061 T6 aluminum. These pens are not retractable, you unthread the forward, cap section and remove it to write. Many high-end pens have this construction. One thing that struck us as less than elegant is that, once you unthread the cap you have to do something with it. It doesn’t slide or thread onto the back of the pen or otherwise conveniently store itself. I’m worried about losing the cap. That said, the pens handle very well. The knurling turned into the forward section and the taper formed by threaded area mean you can grip these well even when wearing gloves, and that is a big advantage to these pens over smaller “space” pens. 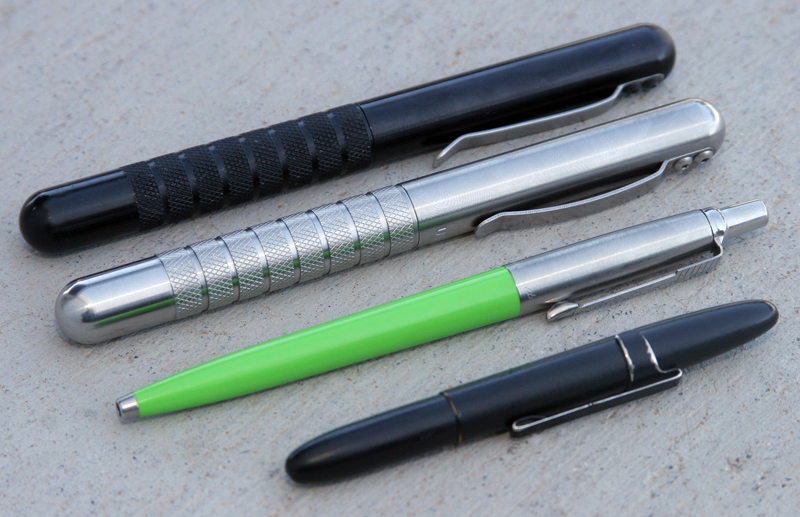 The nice machining and functional shape give these pens durable, functional appeal. These are the threads inside the removable pen cap. Each pen has a 301 grade stainless steel clip bolted to the main body with two Torx threaded fasteners, a big improvement over the little Fisher Space Pen that has a clip-on pocket clip that can slide up and down the pen body- and eventually fall off. That won’t happen with the County Comm pens. Disassembly of the pens is easy, simply unthreading the cap and the top of the pen exposes the Fisher Space Pen cartridge which fits precisely inside the housing. Writing with and carrying these pens is a joy. They feel great and, as mentioned, are one of few pens that work well wearing Nomex flight gloves or tactical assault gloves. Another nice feature, especially of the robust Stainless Steel pen, is that you can find them easily in a pocket. Since these pens are large they are easy to find but may not fit in all pen tube storage holders. Triple Aught Design had a small Velcro pen storage tube some time ago and this pen is too large for that little fabric/Velcro accessory tube. The function and robust nature of the design, quality of the manufacturing and engraving and overall fit and feel of the pen make it functional and attractive. Pull this out in a board meeting and it will get attention. Jot down coordinates or radio freqs in the dark cockpit of an EC-130E Compass Call and it won’t fail you. The County Comm pens on top of a Spec Ops Brand check book holder. County Comm Government Products Group is a fascinating company with a host of useful items that are difficult or impossible to find anywhere else. Many of these are County Comm designs, some are sourced from other companies and compiled into their quaint and convenient shopping portal. Their unique tactical pens are just one product category of many. County Comm’s website is a worthwhile stop for the military, law enforcement, tactical enthusiast and technology fan and their tactical pens are a great introduction to their products.